Parkland, Feb 15 (Just News): A 19-year-old gunman returned to the Florida high school where he had once been expelled for disciplinary problems and opened fire with an assault-style rifle on Wednesday, killing 17 people and injuring more than a dozen others before he was arrested, authorities said. The violence erupted shortly before dismissal at Marjory Stoneman Douglas High School in Parkland, a placid, middle-class community about 45 miles (72 km) north of Miami. Television footage showed images, increasingly familiar in America, of bewildered students streaming out of the building with hands raised in the air, as dozens of police and emergency services personnel swarmed the area. Florida’s two US senators, briefed by federal law enforcement officials, said the assailant wore a gas mask as he stalked into the school carrying a rifle, ammunition cartridges and smoke grenades, then pulled a fire alarm, prompting students and staff to pour from their classrooms into hallways. He was identified as Nikolas Cruz, who previously attended the high school and was expelled for unspecified disciplinary reasons, Broward County Sheriff Scott Israel said at a news briefing hours later. Officials spelled his first name differently earlier in the day before correcting themselves. As a high school freshman, Cruz was part of the US military-sponsored Junior Reserve Officers’ Training Corp program at the school, according to Jillian Davis, 19, a recent graduate and former fellow JROTC member at Stoneman Douglas High. Twelve of the dead were killed inside the school, two others just outside, one more on the street and two other victims died of their injuries at a hospital, Israel said. He said the victims comprised a mixture of students and adults. The Valentine’s Day bloodshed in the Miami suburb of gated communities with palm- and shrub-lined streets was the latest outbreak of gun violence that has become a regular occurrence at schools and college campuses across the United States over the past several years. 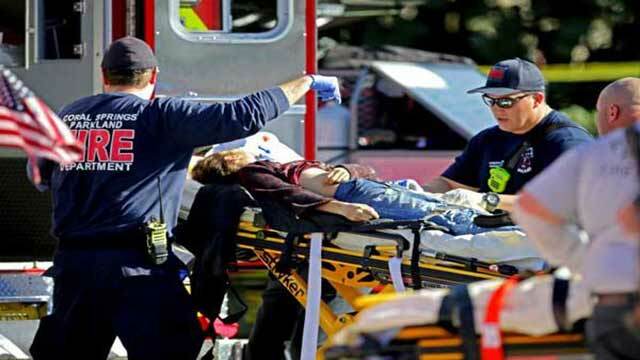 It was the 18th shooting in a US school so far this year, according to gun control group Everytown for Gun Safety. That tally includes suicides and incidents when no one was injured, as well as the January shooting in which a 15-year-old gunman killed two fellow students at a Benton, Kentucky, high school. Staff and students told local media that a fire alarm went off around the time the shooting started, sparking chaos as some 3,300 students at the school first headed into hallways before teachers herded them back into classrooms, to seek shelter in closets. “It is just absolutely horrifying. I can’t believe this is happening,” Lissette Rozenblat, whose daughter goes to the school, told CNN. Her daughter called her to say she was safe but the student also told her mother she heard the cries of a person who was shot.